Who gave the same name "Mound of Dead" (Lothal & Mohenjo-daro) in different languages to these two places? Some people may had seen and known about the name and its meaning before calling the new abandoned place with same name in local language. Massimo Vidale As far as I know, these names were independently given to the sites by the local villagers. The Sindhi ethymology of Mohenjo-Daro, however, has been long debated, and there is no certainty that the original meaning was "Mound of dead". Who knows? Probably the modern inhabitants of the area surrounding the sites after they found ruins and objects on their surface. This is not surprising and neither uncommon across the world. I am not clear on the origin of the phrase “Mound of the Dead”. I think Prof. Kenoyer can say more about this. 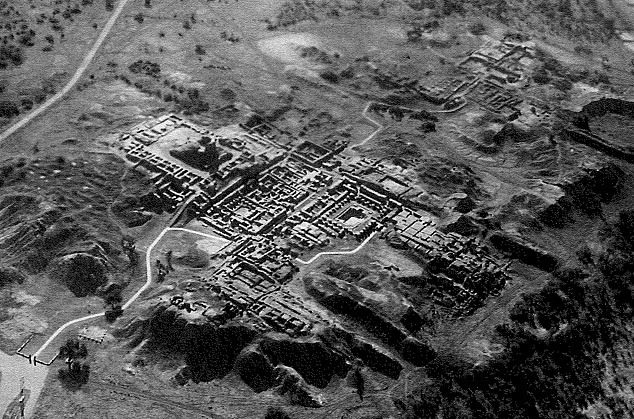 Above: Mohenjo-daro, Aerial view. S.R. Rao in Lothal (p. 18) wrote: "The word 'Lothal' in Gujarati formed by combining the words Loth and thal (sthal) means 'the mound of the dead'. The word 'Mohenjodaro' in Sindhi also conveys the same meaning."